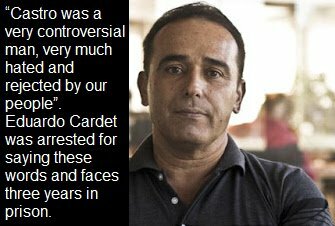 Amnesty International has updated its Urgent Action for Cuban prisoner of conscience Eduardo Cardet and extended it to May 8, 2017. Dr. Eduardo Cardet Concepción, leader of the Christian Liberation Movement (Movimiento Cristiano Liberación, MCL) since 2014 was sentenced to three years in prison on 20 March. He was arrested in Holguín on 30 November 2016, five days after the death of the former leader of Cuba, Fidel Castro. He has since been held in the provisional prison (prisión provisional) of Holguín and will remain there while he carries out the appeals. Eduardo Cardet was charged with attacking an official of the state (atentado) after he publicly criticized Fidel Castro a few days after his death. Prior to his arrest, Eduardo Cardet had given interviews published in international media in which he had been critical of the Cuban government. In an interview with Madrid-based radio station esRadio, aired two days before his arrest, he described the mourning in Cuba following the death of Fidel Castro as imposed, and said: “Castro was a very controversial man, very much hated and rejected by our people”. His lawyer has until 31 March to file an appeal. Urging them to ensure that, pending his release, he is provided with any medical care he may require; that he is not tortured or otherwise ill-treated; and that he is granted regular access to family and lawyers of his choosing.